The aspheric surfaces on the 31mm Baader Hyperion Aspheric Eyepiece eliminates distortion without extra elements, weight, or price. Supplied with a 2" barrel and 1.25" barrel. The 31mm Baader Hyperion Aspheric Eyepiece threads onto the back of most SCT rear cells, producing a rigid connection for imaging. A wide 72º field of view and excellent eye relief are hallmarks of this great eyepiece! 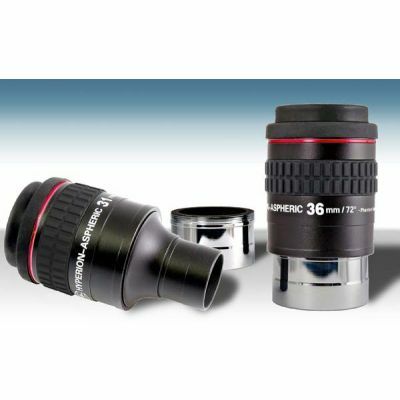 The ultra-wide 72º field of view of these eyepieces are extremely flat and without distortion, and are virtually free of angular magnification distortion. The Hyperion Aspheric eyepieces accept Televue's Dioptrx astigmatism correcting lenses. The 31mm Baader Hyperion Aspheric weighs 13.8 ounces or 390 grams.